The main steps of development and achievements of the foundry department at OAO NPO “TsNIITMASH” are set forth. Many of the department’s staff are known not only in the RF, but also far outside it. For many years of work and achievements, TsNIITMASH’s founders were given State and Government awards. Theoretical and applied developments of the department that are in demand and topical today are pointed out. Key words:Castings, department, cast iron, molding materials, furnace, molding sand, graphite, sand. Studied is the effect of silicon on Ar1 temperature, silicon and carbon contents in austenite, conditions of releasing structurally free carbon in the form of spheroidal graphite, and microstructure of high-alloy chromium-nickel iron. Key words: chromium-nickel iron, spheroidal graphite, Аr1 temperature, microstructure, silicon, carbon, austenite, mechanical properties, wear-resistant castings, radiation intensity. Presented are results of investigations into the degradation (change) of flake graphite iron structure in ingot mold operation by the method of ultrasound (US) checking. Shown is the possibility of positively predicting the probability of emergency failure of an ingot mold during its further use by the level of decrease in US velocity in the mold’s cast iron by 7 to 10% during service. Key words:Flake graphite iron, ingot mold, steel, graphite, metallic base, perlite, ferrite, ultrasound check. Silicon and modifying influence melt on stability austenite is studied at cooling nickel-chromium cast iron with the various form of graphite, and also micro alloying on its mechanical and operational properties. Key words:Nickel-chromium cast iron, flake graphite and nodular graphite, austenite, a magnetic susceptibility, modification, micro alloying, the modifying, alloying elements, wear parts, asphalt and concrete. A technology of melting ferrosilide in an induction furnace of the type IST-0,16 has been developed. Corrosion resistance of grade ChS15 ferrosilide in accordance to GOST 7769-82, and ferrosilide additionally alloyed with chromium has been investigated. It is shown that ferrosilide alloyed with chromium has a 25% lower speed of anodic dissolution than ferrosilide without chromium addition. An industrial technology of making cast sacrificial anodes has been fine-tuned. Key words:Ferrosilide anode, grounding electrode, electrochemical protection, corrosion activity, silicon iron, casting, chemical composition, melting, charge materials, mechanical properties. A method for studying the fracture toughness of molding compounds. Exploring different mixtures of water glass, mixtures for «foskon-process» and «furan-process» resistance parameters are mixtures of cold-box processing. As the findings indicate the direction of future research in the context of determining the relationship of fracture toughness mixtures of cold-box processing with surface defects of castings. Key words:Crack, metal penetration, moulding, mixtures, casting, heating temperature, the sample defects, surface. Proposed are models of molding sands based on their grain structure. The models differ by porous structure, depending on powder fraction content. By using these models, anti-penetration properties of molding sands can be predicted. Key words:Molding sand, penetration, pore, structure, grain structure, powder. It is shown that the amounts of clay component and fine fraction in quartz sands have a crucial influence on the strength characteristics of cold-hardening water glass bonded sands hardened by esters. Use of sands with a low content of clay and <0.1 mm fraction allows to produce high-strength molding sands with a reduced binder level, and thereby to decrease the labor intensity of shakeout work by several times. Key words:Sand, water glass, molding sand, properties, strength, clay, binder. Discussed are the technological aspects of making composite rolls. It is pointed out that the advantages of the centrifugal method of making such rolls, as compared to alternative ones, consist not only in the efficiency of making multilayer blanks, but also in the possibility to produce large-tonnage articles with an adjustable thickness ratio of different metal layers, including those from hard-to-deform alloys. 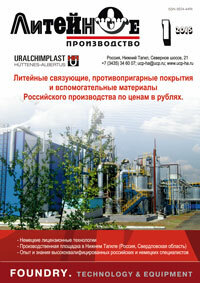 In the historical context, discussed is the development of the manufacturing process at domestic metallurgical plants. Key words:Roll, rolling, assortment, technology, working layer, core, centrifugal casting, rolling mill, high-strength iron.